This is historical film set during the Edo period and starring popular talent Aya Ueto and great actor Kengo Kore (The Story of Yonosuke). She takes the lead role as Oharu (Ueto) who is an excellent cook and because of her skills she gets to marry into the Funaki family through Yasunobu (Kora). The Funaki family are the cooks of the Kaga Domain and they utilise Oharu’s cookery talents to teach Yasunobu how to better his skills. The story revolves around two siblings, a young boy named Sotha and his older sister Haruna, who lost their parents after a major earthquake. Despite finding a safe home with their aunt and uncle the two children find it hard to fit in with their new lives not least because Sotha doesn’t know that their parents are dead and Haruna wants to tell him. I need to revamp and update the 3/11 film list because nearly four years on from the event and Japanese filmmakers are still making films concerning the disaster. 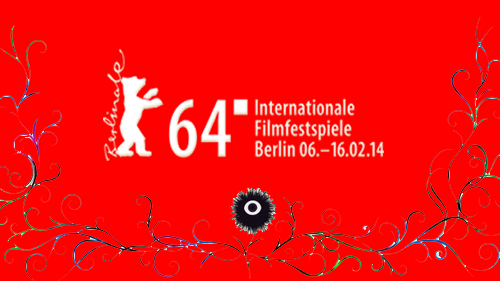 This drama stars some impressive names like Kenichi Matsuyama (Norwegian Wood) and Sakura Ando (Love Exposure). Jiro (Matsuyama) returns to his former farming village which has been evacuated due to the fact that it lies near Fukushima Daichi and is badly contaminated. Jiro begins cultivating the land and teams up with an old school friend to plant rice despite the spreading radioactivity and its effects on their health. Meanwhile, Jiro’s half-brother has left the town with his wife and child and their mother. When their mother hears that Jiro has returned to their land she wants to go home and see him again. A late edition and not a Japanese film but it stars a favourite Japanese actress of mine, Rinko Kikuchi. It’s about a lonely woman named Kumiko (Kikuchi) who lives a dul life as an office drone. One day, when walking along a beach, she sees a videotape on the shore and takes it home and watches a strange film about a man burying treasure in Minnesota. She convinces herself that there is treasure to be found and goes on a modern day treasure hunt in the deezing North Dakota wilderness. This set-up reminds me of a heart-breaking short film I recorded from UK television about a Japanese woman who watches Fargo and heads to the actual locations. Continuing on from the last two years, the organisers have selected a lot of classic titles from golden age (from directors like Ozu, Mizoguchi, Naruse) and older (1930s and 20s!) because of all the films undergoing digital restoration in Japan. 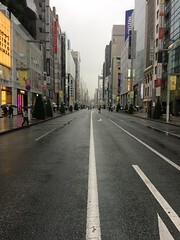 Last year of Keisuke Kinoshita was the focus while this year audiences can get to watch films from multiple directors. There are some war and government sponsored films including Five Scouts, Tomotaka Tasaka’s 1938 tale of a group of scouts fighting through heavy opposition to deliver reconnaissance information to his company so his wounded comrades can evacuate back home. Apparently it depicts the war ‘realistically’ to show the dreariness and misery of operations. The War at Sea from Hawaii to Malaya was a 1942 propaganda film designed to encourage patriotism as it shows attacks on Pearl Harbour and British warships. The main character is a hot-blooded young man who flies from an aircraft carrier. As we follow his training we see documentary-style footage of training and possibly even actual news images. 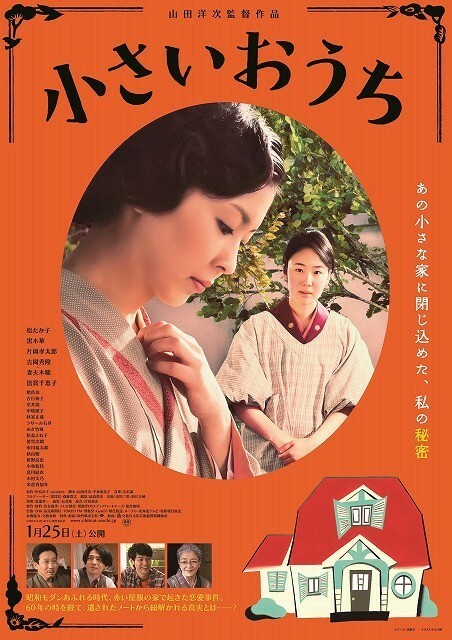 The 1926 film Light of Compassion by Henry Kotani is a social drama commissioned by the government and is about a boy named Junichi who lives in the slums with his mother but finds a way out when he defends a rich girl named Shigeko from bullies and she and her family take a shine to him. There are quite a few jidaigeki like Teinosuke Kinugasa’s 1928 film Crossways which takes place in the Yoshiwara district and follows a young man named Rikiya who falls for the beautiful Oume and the tragedy that follows when violence enters his life. Humanity and Paper Balloon is the 1937 film from Sadao Yamanako (and easily available in the UK) which takes place in a crowded slum in 18th century Tokyo where a samurai named Mori and a barber named Shinza battle each other for control of gambling and Shinza kidnaps Mori’s wife who was forced to marry him… Singing Lovebirds (1939) is a musical about a cast of characters who fight for the affections of a young woman named Oharu who only has eyes for a ronin named Reisaburo. An Actor’s Revenge (1935/6) by Teinosuke Kunigasa is just as the title describes. Set in 1863 the story follows a man named Yukinojo takes revenge on three local officials who drove his parents to suicide. 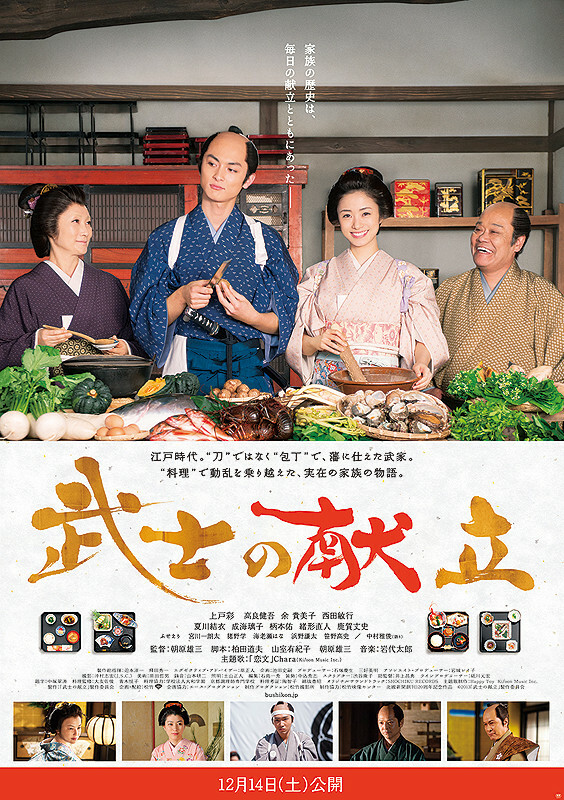 Yukinojo, in the intervening years, has become a well-known ‘onnagata’ (a man playing female roles) in a kabuki troupe which travels to Edo (the old name of Tokyo) where he discovers his three archenemies in the audience and plots revenge. There is the silent film Tokyo Hero (1935 Dir. Hiroshi Shimizu) about the wife of a man who flees his creditors being forced to be a bar girl (scandalous at the time) and the impact it has on her children. 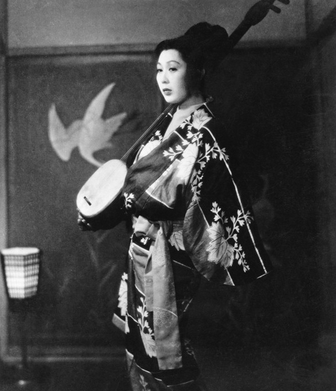 A Mikio Naruse film is screened in the shape of Tsuruhachi Tsurujiro (1938), a melodramatic story about the thwarted love between a shinnai singer and his partner who plays the shamisen. Never mind Kurosawa, Naruse and all the rest. The big title amidst all of these classics is Kenji Mizoguchi’s wonderful Ugetsu Monogatari from 1953 which is set in the Sengoku period and follows a potter named Genjuro and his brother-in-law who leave their loyal wives to become famous samurai only for tragedy to strike Genjuro when he comes under the spell of Lady Wakasa and the ghosts she is surrounded by. 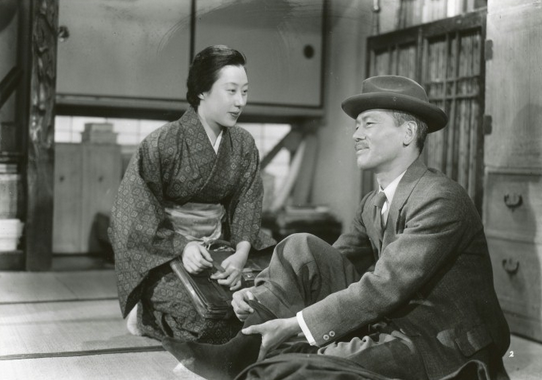 The list of Ozu films include Late Autumn about the schemes of a group of men to marry off the daughter and widow of a recently deceased friend. 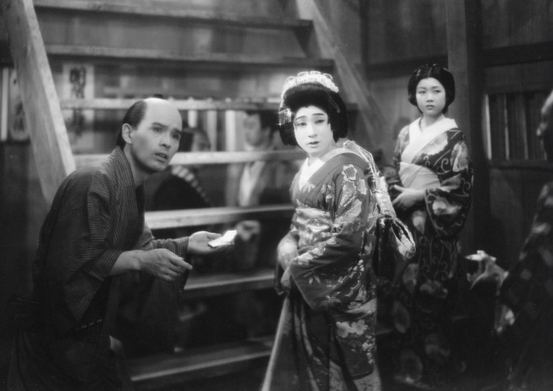 That Night’s Wife is Ozu’s crime drama from 1930 where a guy desperate for money for his daughter’s medical bills robs a bank but the police are hot on his tail. Apparently, what makes this interesting apart from Ozu’s eye for great visuals, are the social changes taking place (Japan modernising, financial crisis) that are noted in the film and Ozu’s usual interest in family matters. There are three features from the director Noboru Nakamura: Doshaburi (When it Rains, It Pours), released in 1957, is a melodrama about a family where the women love men who treat them badly as they refuse to commit to marriage and yet still hang around. The Shape of Night about a bored factory worker who falls for a vile Yakuza and moonlights as a bar hostess and worse… To end on a happier note there is a screening of Home Sweet Home (1951), where a common family, mother and father and four children, all live in a house. 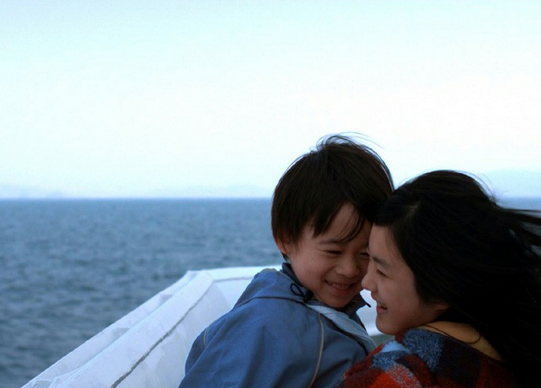 The parents struggle to pay their bills and support the artistic ambitions of their children like Tomoko, an aspiring painter, and it looks like they might lose their house when a stroke of good fortune comes to provide them happiness. A snow-covered house is situated in the middle of a rice field. What should one do, in a space of white and quietude? By spring, the snowy hut melts and loses its appearance. The festival is already under-way but there are multiple chances to see all of these films over the course of this week! Oh, I sort of feel like every Yoji Yamada film I’ve ever seen has been a romance, in one sense or another 🙂 I feel slightly ashamed but I really want to see the Samurai Cooking movie!!! I’m looking forward to your reviews of Love Strikes! and The Drudgery Train!! The classics look like a great draw and if I had to pick one film it would be Ugetsu Monogotari. I would love to see that in a cinema! I was also interested in An Actors Revenge partly because the plot and the film stills looked intriguing. The plot also reminded me a little of Fuse: A Gun Girl’s Detective Story which I looove. How was the film? What are your thoughts on An Actor’s Revenge? YES! Another fan of The Drudgery Train. I really liked The Drudgery Train as well. The unconventional hero we can all cheer for unlike Fujimoto in Love Strikes! which I now consider something of a horror film. Ah! I see! It’s a really interesting film – Ichikawa filmed in a kind of Kubuki-esque style so it’s got all these great theatrical moments. You can get it fairly easily from BFI but the quality isn’t fantastic. Thanks for the info. I may purchase it at some point then since my knowledge of Japanese films that old is limited to some of the DVDs released by Eureka. I think we’re both in agreement about the films then. I have spent the past week puzzling over why anyone would find Moteki and Fujimoto funny. 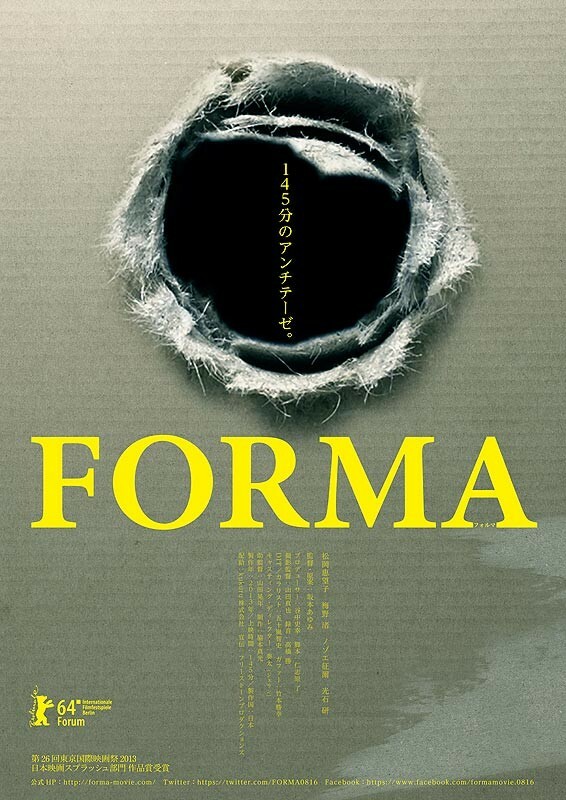 I even wrote a review in Japanese about it and figured that for me it is less a comedy and more a cautionary tale for guys… Fujimoto just an arse… I think I’ll use that quote in my review for this blog as well if only because that’s the best way to describe him! Bit late in mentioning this but you missed a Japanese related movie that stars one of your favourites……I’ll leave the link here! Doesn’t seem to be a trailer about but it did Sundance so I guess it could head toward Sundance London? Thanks for the link! It’s an American film so I didn’t include it. I guess I could… Anyway, it reminds me of a short film I saw on Channel 4 about a Japanese woman who goes in search of the locations of Fargo. Great to see that Rinko Kikuchi is getting more work!